Welcome to Six Giraffes! And Six Giraffes, welcome to the world! As soon as I purchased a copy of the print above, I knew it would be perfect for my inaugural post. It comes from The Paper Princess Finds Her Way by one of my very favorite children's authors and illustrators, Elisa Kleven. 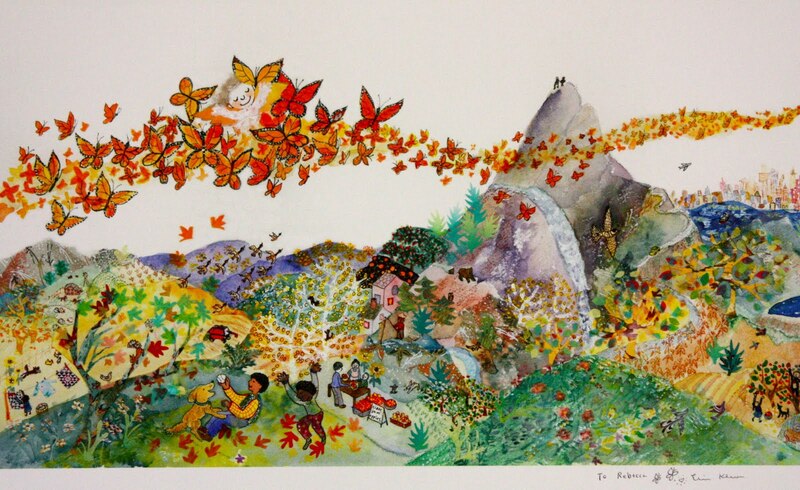 Her bright, whimsical collage captured my heart when I first met her and her stories at the Orion School Children's Authors and Illustrators Festival in 2002. Her sweet characters and bold colors pushed me to follow my own dream of writing for children. And so, here I am! What will you find on Six Giraffes? Well...it remains to be seen, but I imagine you'll be reading about children's literature, the world of teaching and young children, as well as smatterings of my other personal passions (baking, photography, nature, philosophy, my sweet pup...) Thanks for joining me on this journey as I Find My Way!